Sometimes a motif gets stuck in your mind and then suddenly you start seeing it everywhere. 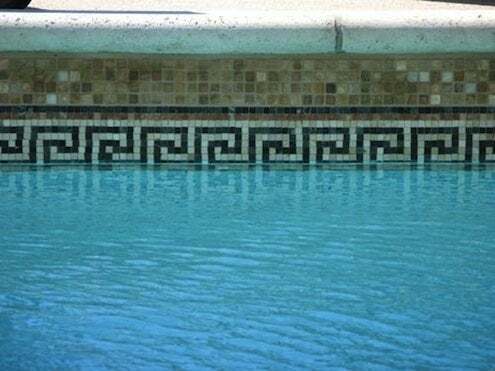 One classic architectural image that seems to be popping up in everything from tile to textiles is the time-honored Greek key motif. There are numerous historical speculations about the source of these meander patterns; one of the most popular is that the design is drawn from Greek mythology and is a physical representation of the labyrinth that imprisoned the fearsome Minotaur. Another theory holds that the design is based on the twisting course of the Maeander River through Asia Minor. In any case, the Greek key version of a meander is used extensively on vases, sculptures, architecture and on bronze shields from ancient Greece. Most ancient Greek temples incorporated this design as a illustration of the concepts of infinity and unity. The pattern also was prevalent in tile, mosaics, and architecture throughout the ancient Roman Empire. 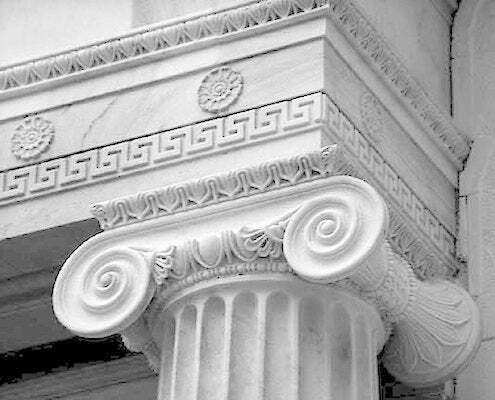 Greek key patterns came into vogue in the United States as an important element of Neoclassical architecture during the late 18th and early 19th century. Indeed, many of our most beloved buildings in Washington, D.C., incorporate this design element. 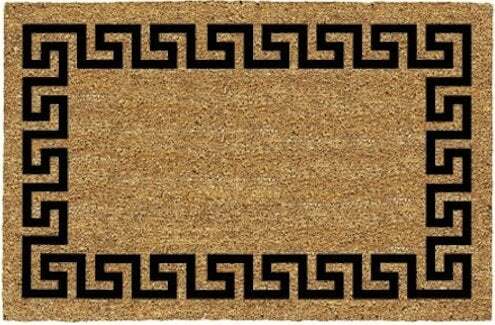 Today, the Greek key is used as a fashionable embellishment in both exterior and interior design and is especially prevalent as a decorative border. Nearly all major tile manufacturers offer some version of a Greek key design, either in allover tiles, listello border tiles, or in mosaic tiles. Carved Greek key patterns also offer attractive choices in moldings. The motif is a perennial best-seller in wall coverings, wallpaper borders, and decorative fabrics. 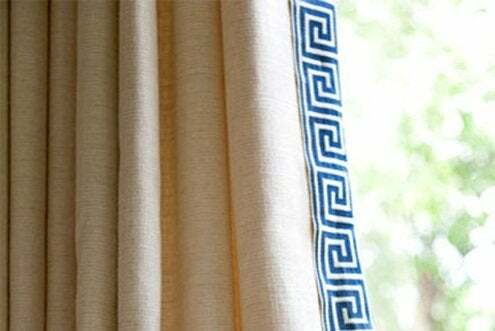 Greek key patterns also are virtually omnipresent in home decor. Tthe motif is widely used in carpets, accent rugs, furniture, drapery hardware, bath hardware and a wide range of home textiles, including bedding, bath towels, rugs, shower curtains, table linens and window treatments. The motif even shows up in fine china and casual dinnerware—indeed the ubiquitous New York City paper coffee cup features a Greek key border. And if that doesn’t prove its popularity, I don’t know what does!